Open enrollment for health insurance coverage in 2015 right around the corner. However, are Americans aware that open enrollment starts on November 15, 2014? According to the latest Kaiser Family Foundation (KFF) tracking poll, there are some major gaps in the awareness of uninsured Americans, who the upcoming open enrollment outreach have been targeting. 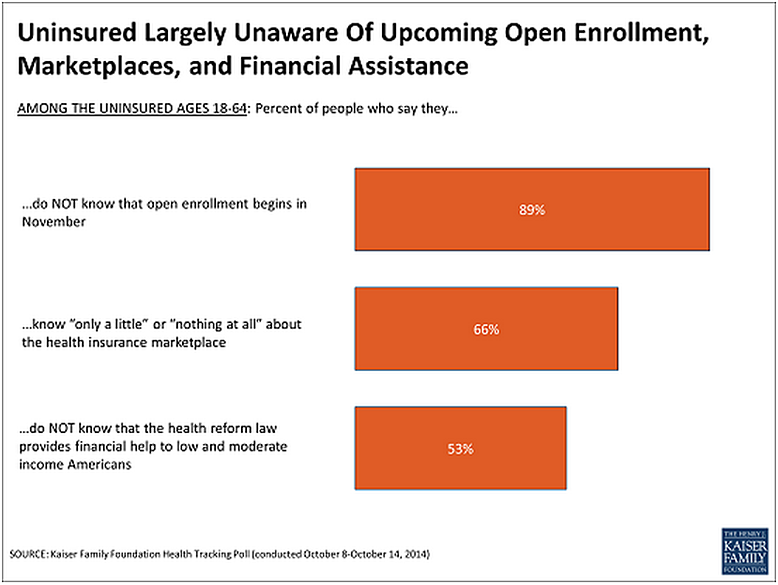 The KFF poll results revealed that 89 percent of uninsured Americans are unaware that open enrollment begins next month. Here are more key findings from Kaiser’s most recent poll. The latest Kaiser Family Foundation tracking poll was conducted via telephone interviews from October 8, 2014 through October 14, 2014 among a sample of 1,503 adults ages 18 and older. The interviews were conducted in English and Spanish. The margin of error is + or - three percentage points for the full sample and 9 percentage points for the uninsured sample. Two thirds of uninsured (66 percent) reported knowing “only a little” or “nothing at all” about the health insurance Marketplaces. Over half (53 percent) of the uninsured are unaware of financial assistance (premium tax credits and cost-sharing subsidies) to help low and middle income individuals purchase health insurance. Over half (59 percent) of the uninsured say they plan on obtaining coverage within the next few months. 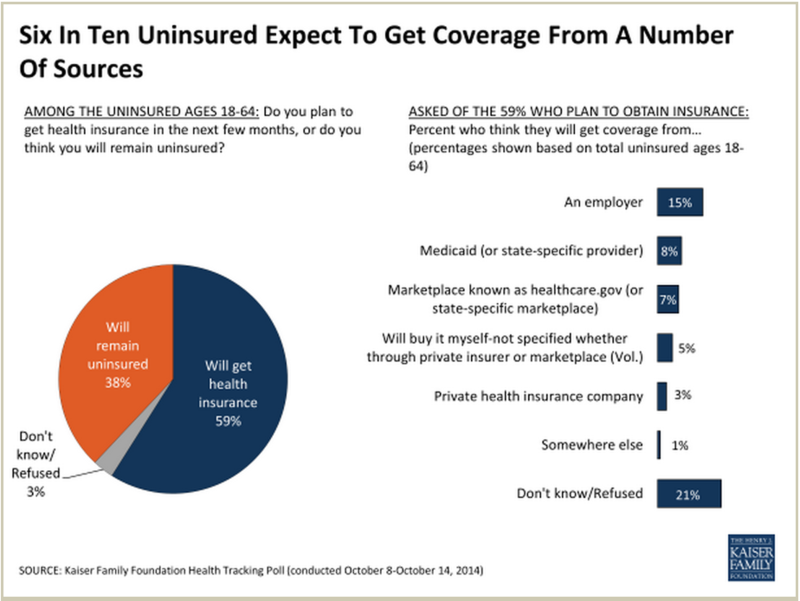 Of those uninsured Americans who plan on obtaining coverage, 15 percent expect to obtain coverage from an employer, while another 15 percent plan to purchase it themselves, either directly from the insurance company or through a Marketplace. One-fifth (21 percent) of pollees planed to get coverage, but were unsure of where they would obtain it. 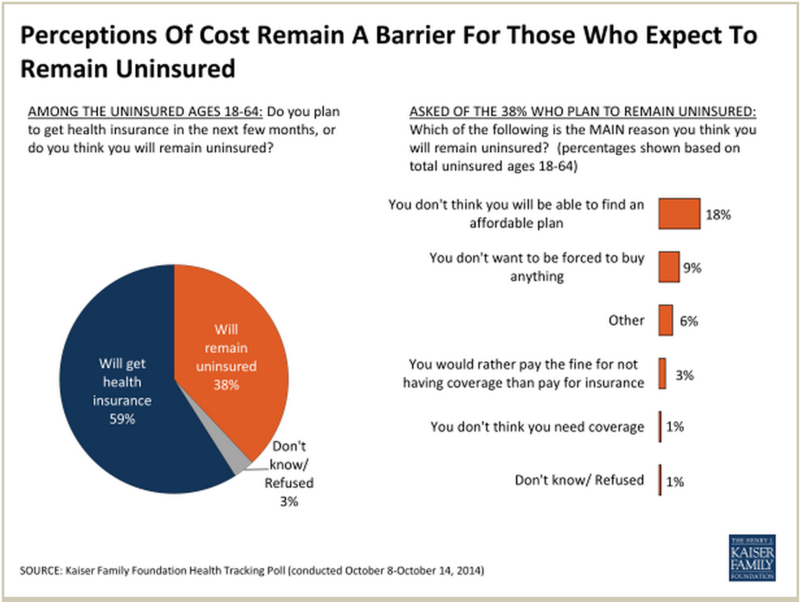 Eighteen percent do not think they will be able to find an affordable plan. Nine percent do not want to be forced to buy anything. Three percent would rather pay the fine than pay for health insurance coverage.